"David Bowie, Justin Timberlake, Madonna; pop culture is no stranger to reinvention. When the public tire of a persona or an artist wishes to make a change, the old looks, personality or profession can be remade and resold in the same climate. That said, it's a process which can chew up and spit out- just ask Amanda Bynes's cheek piercings." So began my first draft of this piece. 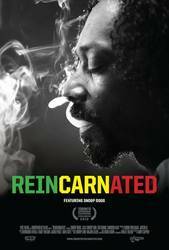 Having enjoyed Reincarnated, I set out to write a review with a heavy focus on Snoop Dogg's transformation from elder statesman of hip-hop to reinvigorator of reggae. To the casual observer, that's simply the most striking aspect, as he changes everything from religion to hairstyle. To do so, however, would ignore the essence of the enigmatic personality at the forefront: Calvin Cordozar Broadus, Jr., 41-year old rapper, actor, family man and ex-pimp. Reincarnated succeeds at breaking through the – ahem – smokescreen of cool and calm which pervades Snoop, far removed from the 'yah mon' artifice of Sting and his ilk. We witness Snoop's elation when met with applause from a deprived community, to his affinity with the last remaining Wailer, Bunny. These emotional highs are complemented by the myriad lows; the startlingly personal accounts of the death of Tupac Shakur and the decline of Death Row Records, for instance. There too are chilly moments. Snoop's stony reflection on his childhood, his trial for murder and his time as a pimp make you realise that not only is Snoop a man of depth, but also as something of a moral ambiguity. The intensity with which he recounts his arrest for illegal guns in 2006, and how he feels that left his family vulnerable, is remarkable. At times it seems that Reincarnated would benefit from further guided interviewing and a more detached style. However, it seems unlikely that would've resulted in some of the earnest revelations from the maturing gangster. And perhaps fewer scenes featuring so much cannabis. Because boy is there a lot of it, enough to get a buzz just from being a viewer. Whether it's in bags or plantations, whole reams of the documentary are Snoop, his cohorts or random Jamaicans getting off their mash on weed pipes. And joints, blunts, bongs. At times it seems gratuitous, but on further reflection, it reflects how the drug plays an important social role. Smoking grass helps Snoop and his friend Daz Dillinger heal when Dillinger receives word of a death in the family, and contributes to a new peace Snoop exudes. He grows closer to his wife and, surprisingly, for the man who wrote "Serial Killa," condemns gun crime on the tune “No Guns Allowed”, featuring his daughter singing. It would've been particularly interesting to hear more from his spouse, Shante, and child, Cori, beyond what we're shown, plus fewer empty platitudes from Louis Farrakhan. That said, director Andy Capper has done well to utilise and build on the skills he has honed in shooting Vice short documentaries. There's a flow to Reincarnated brought about without the need for a narrator, letting events take their course as we go along for the ride. The prolonged views of vacant lots, worn-down buildings and pot-holed roads are granted the context they deserve. Jamaica's poverty emerges as a constant, depressing theme, the darkness to the prevailing sunshine and optimism. This ranges from the arrest of Chris 'Coke' Dudus to the gritty conditions of Trenchtown, birthplace of Bob Marley. Capper ends up taking in such a variety of points that it seems a shame there isn't further investigation into the likes of contemporary Jamaican reggae or the young musicians of Alpha Boys School. Ultimately, there's little argument about whether or not Snoop is reborn, reincarnated or retooled. Indeed, largely for this reason, the film may attract criticism for being soft on the rapper. However, that would be a misinterpretation of the prevailing Vice style, the depth with which director Andy Capper and his crew intergrate themselves into Snoop's daily life. It's hard to imagine Jeremy Paxman respectfully letting Dillinger receive his grim news and allow it to grow organically. Ultimately, the film shines brightest when it's Snoop alone, open and earnestly recounting his past, looking to change for himself and his family. That, and to get higher than Rick James on a rollercoaster. Posted June 17, 2013, 7:24 p.m.
Posted Oct. 30, 2013, 5:07 p.m.